and expressive player emerging. I was in the audience at the Final in 2009 and not only was she a worthy winner but one of her many qualities is her ability to engage with an audience and draw their attention to her story-telling; she is an honest performer, expressive, with great technical control and a very good chamber musician too. Vertical Song 1 by Toshio Hosokawa came next and here I felt Pernille really came into her own as a performer. It was a theatrical performance of a beautifully still and spiritual piece, with so much great and confident variation of tone and technical command. There was a wonderful stillness in the audience as the piece started and the storytelling was fantastic. The last piece of the first half was the Castrucci Sonata Op. 1 no. 10 in D I\/Iinor. It was a great finisher, expressively played. These sonatas are ernille really brought it to life. She was joined by a wonderful continuo team in Gunhild and Thomas and together they made it great. There was a perfect marriage between the two instruments, a symbiotic—Iike communication between the two performers and at points the listener didn’t know where the recorder sound ended and the accordion started, suiting the title which loosely translated means ‘fire mirror’. lt was pure magic the way these two interacted, the breathy tone of the accordion in complete harmony with the recorder — gorgeous! There was a very clever use of different recorders and the range got lower as the piece progressed. Another Castrucci sonata followed, this time Op. 1 No. 2 in E Minor, which Pernille played on the voice flute. Again there was beautiful ensemble work from these accomplished musicians. 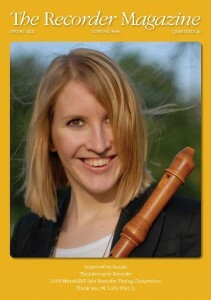 Entourage for Recorder by Kasper Rofelt was written for and in collaboration with Pernille in 2010 especially for this concert. Pernille wished for “a work that was not so virtuosistic. 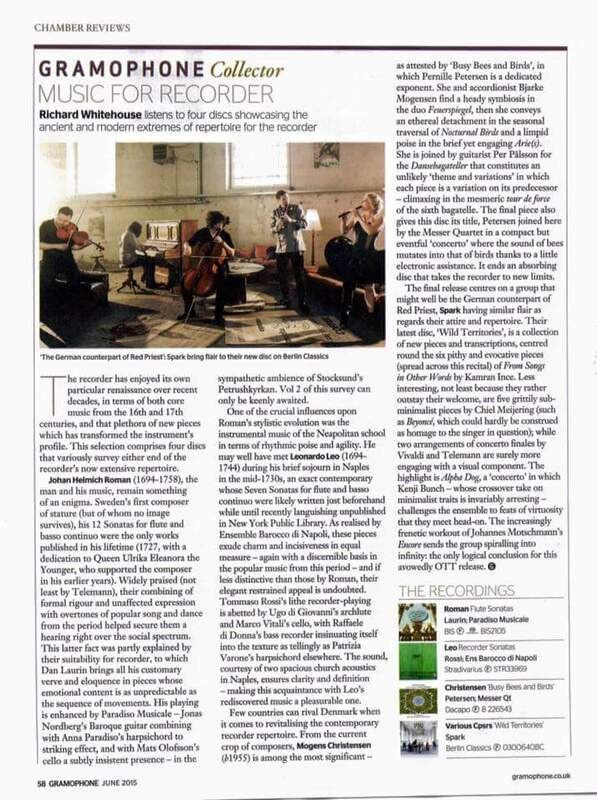 but more like a calm, musical interlude in a very expressive and demanding programme”. Of it the composer says, “The soloist is examining her surroundings where more than one idea is elaborated and combined in several different ways. You can view the material of the music as a landscape to be examined in a given time frame.” This was a lovely atmospheric piece; a real palate cleanser. Pernille concluded her prize winning concert with the final Castrucci sonata ofthe evening this time Op. 1 No. 3 in G Minor which she played on the descant recorder. This was a brilliant and once more virtuosic performance of the Castrucci set. Det er oftest en falsk varebetegnelse at skrive debutkoncert om elever, der afslutter deres uddannelse fra konservatoriernes solistklasser. Tirsdagens debutant er repræsentativ og endda lidt mere: med sine kun 27 år har blokfløjtenisten Pernille Petersen vundet flere prestigefyldte internationale priser, er solist og kammermusiker her og i udlandet, og er efter flere cd-indspilninger i gang med sin egen solo-cd. Så ikke uventet, men alligevel imponerende og glædesfyldt var mødet med et stortalent på sit instrument, der inviterede os indenfor i sine mange musikalske rum. Aldeles uimponeret over eksamenssituationen, med en helt naturlig publikumskontakt, med smil, med underfundighed, med en bragende musikalitet og en fabelagtig og naturlig rytmesans inspirerede hun i sjælden grad sine medspillere i værkerne af Vivaldi, Leclair og Castrucci, de gamle barokmestre. Det hele virkede som en leg. Det er det jo ikke, men musikken sprudlede og gnistrede i al sin krævende kompleksitet. Pernille Petersen ville gerne vise mere af sin tekniske alsidighed, og havde bestilt et fint lille værk hos den unge komponist Kasper Rofelt. I hans Entourage afsøger instrumentet sine muligheder, musikerens stemme synger duet, tostemmigt eller unisont, med fløjten, besindigt, afmålt, idérigt. I aftenens anden uropførelse, Feuerspiegel af Mogens Christensen, opfører accordeon og blokfløjte en lille musikalsk spejldans. Utroligt, hvor tæt toner fra begge instrumenter smelter umærkeligt sammen. Tæt pardans i mørke, med fine ildprojektioner på bagvæggen. 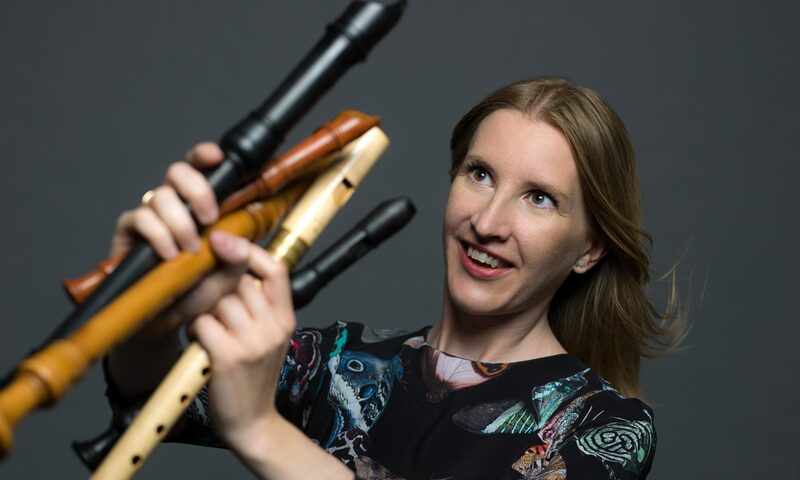 Imponerende at Pernille Petersen efter varmt bifald havde overskud til et ekstranummer, en transskription af Vivaldis koncert La Notte, hvor hun og Bjarke Mogensen tryllede og legede.